In my last installment on time management, I want to talk about organizing your mind. (you can find the previous three articles here, here and here). Organizing your mind is just as important as organizing your space or your time. As a Visual/Spatial person your mind can run at 100 mph all day long, making it difficult to focus, let alone accomplish anything constructive. But there are some tricks that can help. One of the first things Visual Spatial (V/S) people need to do is write things down. All of it. When something comes to mind, write it down! Why? 2 reasons: 1st, when an idea hits, it usually doesn’t stay long, which means it is gone 5 minutes later. So when that great idea shows up, record it! Post it notes are great for jotting things down. 2nd, when you have 100 things swirling around in your mind, it makes it hard to concentrate on the task at hand. Writing it down lets your mind focus because you know you won’t forget to call Penelope about the carpool. Another way to clear your mind is to do something creative. Most Visual/Spatial people are creative types. Being creative doesn’t necessarily mean doing crafts or making a quilt. It can be writing, cooking, or even organizing an activity. Doing creative things regularly helps to keep us from getting overwhelmed by the sameness of routine. V/S struggle with routine because it gets boring. Being creative allows our brains to have fun. Fun is good! So, plan some creative time into your week. It will make you more productive the rest of the week. When you are in the middle of a project, but need to leave it and finish it later, what do you do? Do you leave it out all over the kitchen table? Do you put it in a box in the closet? Did you know that where and how you put something away can determine whether you finish it or not? Who knew? As a V/S person, out of sight is out of mind. If we put that project away in a box and put the box in the closet and close the door, chances are, we will forget where we put it and lose all enthusiasm for ever finishing it. If you can’t leave your project on the table because it will get covered in peanut butter and jelly, or you need the table for dinner, put it in a clear container. Leave the container where it is out of the way, but where you can see it, such as on an open shelf. It will be there, neat and tidy, waiting for you to come back to it. And your brain will see it and remind you to get back to finishing it. Have you ever had something you knew you needed to do, but really didn’t want to do it? Stand there until you want to! Our brains are reluctant to do things we are not focused on. As a V/S person it can take us a while to move from one activity to another because our brains are still focused on what we just finished. If we stand there (or sit there) and look at what we need to do next, our brains will catch up with us and suddenly we are involved in the new project. So stand there until you want to! The last thing I want to talk about is one of our greatest gifts as a Visual/ Spatial person - our ability to generate ideas. We can create 100 ideas on the best way to do something in 5 minutes. All day long we are generating ideas. We write them down so we don’t forget them, right? As homeschool moms we can think of 15 ways to teach a topic. It really is a wonderful gift. But it can be our worst enemy too. When we generate these great ideas, or we hear someone else’s great ideas, we automatically think we have to DO all of these wonderful things. Nope! We don’t. Trying to do all of those ideas can lead to burnout. Especially if you think you are failing your kids by not doing what everyone else is doing. If you learn only one thing from this series it should be this—Not every idea deserves a life! Repeat that out loud. Post it on your mirror. You do not have to do everything that pops into your head. If you write your ideas down on post it notes first, instead of neatly in a notebook, you can wad up the ones that in a day, or a week, sound like too much work, or are impractical. Then they disappear, never to bother you again. But the ones that you know would be a good use of time and make sense to do, those you keep on your master list. And your stress level can stay at an acceptable level. If there is one. If you have enjoyed this series, you can go to the ldshe.org library and download my class on Time Management- Why Can’t I Make It Work. On there site you can find over 700 classes on all things homeschool from some of the most popular speakers. Be sure to check it out! In my previous articles about time management we have talked about Timers, Time maps and 80/20% principles. Today I want to talk about managing your space as a V/S (Visual/Spacial) or right brain thinker. Managing space as a V/S mom can be a challenge. Our natural tendencies toward space can be our friend or our greatest enemy. We are visual and we tend to use our space to its maximum until the clutter drives us crazy, then we put it all away and then can’t remember where we put it! There is hope! By using some strategies we can learn to manage our piles! First ,we need Gathering Places. These are places to put items that tend to get lost. We have a gathering place for all the car keys. It is simple, just a small basket on the shelf as you come in the house. Everyone knows that is the only place in the house where keys go. We have multiple drivers and we have had teens leave the house in one car with the keys to another car in their pocket! Not a good thing! We also have one place where the school books go. All the music books go in the living room. When you come home from lessons, your book bag of music goes on the floor beside the piano. Every time! All other music goes on the shelf beside the piano. Gathering places can also work with small children’s toys. Putting toys into a basket throughout the day and then before bed putting them away helps keep the stray toys under control. Other things that might need gathering places are bills, mail, shoes, coats, hats and gloves. When there is a purposeful place to put things, they are easy to find again. Next, we have to use the right type of storage. Open shelving can help because you can see where things are. One of the reasons V/S don’t put things away is they are afraid they won’t be able to find it again. With open shelves you can see immediately where things are so you can find them. It also helps you visualize what you have. You won’t need to buy the materials for that project again, because you can see exactly where it is right now. That also leads to less clutter, because you are not repeatedly buying what you already have. Clear plastic storage follows this same concept. You can easily see what you have without having to drag everything out, so you are creating less mess and you are more likely to put things back where they go. Do you forget to read your magazines? A vertical magazine rack can help! Does this sign belong by your desk? Are you a vertical or horizontal piler? Use these for vertical storage if you like to stack things deep on your desk. Or if you are a horizontal piler with piles covering the entire top of your desk, a desk with drawers can help you get a handle on those piles. Not deep drawers! You will never again see the bottom of the drawer. The huge pile will be too discouraging to sort through. I asked Don Aslett this summer what he recommended for paper control. He laughed and said it is a constant battle. We have an overwhelming amount of paper we need to keep track of today that didn’t exist 30 or 40 years ago. If you really need help with this, Don's book “The Office Clutter Cure” can help. Another huge help to controlling clutter is color! Since V/S’s are visual, color coding things can help our brains remember where things go, so we can find them again. As V/S we need to learn about what types of space management that works for us. This summer I gave up on using dressers and closets for my 2 very right brain teen boys. Their older sister sent me this picture and we decided it was perfect for the boys room. Whatever works, right? You can see an interesting computer model here, that might help you decide if you are right brain, left brain, or whole brain. If the model spins clock-wise you are right brain; counter clock-wise, left brain, and if it switches back and forth as you blink, you are whole brain and use both sides, but will typically lean one way or the other. If you have enjoyed these articles on time management , you might want to listen to the class on Time Management I taught at the 2012 LDS Home Educators Conference. I taught one for youth at the 2011 conference as well. The LDSHE Audio Library is now live and you can find my classes as well as over 600 other classes from conferences for 2005- 2012. The 2013 classes will be up soon! Have you ever heard of a Time Map? 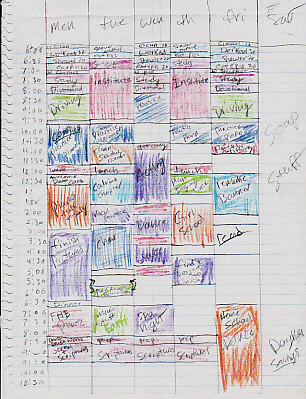 I hadn’t until a few years ago when a planner I purchased included time maps. I had no idea what they were or how to use them, but now I can’t live without them! A time map allows you to see where you are spending your time. You can use one to plan your time or you can fill it in as you move through the day and see where your time really goes. You don’t have to have a fancy one. A piece of paper will do. To make one, jot down on one side of the paper the time from when you get up in the morning until you go to bed, or from when you start school until dinner time. Use what chunk of time you are trying to plan. Across the top make spaces for each day of the week, such as Monday thru Friday or Sunday through Saturday, however you work your week. Now the fun begins. On your map block out the hours you plan on schooling. Then block out each of the afternoon activities you or your children are doing each day. Next, block out times for things like cleaning, making meals, eating those meals, etc. Add anything that to the map that requires your time. Now sit back and look at your schedule. Do you have time for everything you have committed too? Can you see you will have to clone yourself in order to take kids to two different places at the same time? Can you see the reason your family never has a sit down dinner on Tuesday nights? Or Wednesday? Or Thursday? In the picture you can see a time map I borrowed from one of my children. Hers is prettier than mine so we will use this one. My daughter color codes hers so she can see how all her activities fit together. She has goals that say she wants to commit five hours a week to piano practicing. By color coding she can see how she will accomplish that goal. She can also see if she is spending too much time with things that are not in keeping with her goals. She can then decide to either change the goal or change some things so she can spend more time pursing it. In other words, a time map can give you permission to say no! I love my time maps. I work a part time job and I also have other large time commitments. My job is flexible and I work from home. I can use my time map to fit the job into those times when my kids don’t need me. Since homeschooling is my primary focus, I can make sure that those hours are available for my children and not for something that is urgent, but not important. I like to have my week planned before I head to church. It is usually at church that I say yes to things that mess up my schedule. Yes, I can go visiting teaching on Thursday afternoon, and help with scouts on Tuesday and watch Sister Jones’ children on Monday morning so she can…… well, you get the idea. Each of these things is important, but if I haven’t planned my week I won’t remember we have dentist appointments Thursday afternoon, so I can’t go visiting teaching. A better time would be Friday. Knowing where and to whom you are always saying yes to, and making sure you know your time schedule, will save you a lot of hassle and as I said, let you say no with grace. Or say yes with enthusiasm! This leads us to the next two principles. They are called the 80/20 principles. The first one states that 20 percent of your efforts accomplish 80 percent of your goal. In other words, 20 percent of your time and efforts get 80 percent of the job done. The question then becomes, is the project worth the other 80 percent of your time. Sometimes it is, mostly it isn’t. Many times we moms think we have to give everything 100 percent effort in order for it to count. If we don’t we feel guilty. In reality, some things we do really don’t require that extra 80%. An example would be if you were asked to bring cookies to a scouting event. Plain chocolate chip cookies will be wolfed down by the scouts as quickly as hand decorated sugar cookies with each boys name on them. Which one will take less effort and still accomplish the goal of having cookies at the scout event? Now, if those cookies were to recognize each of the boys for having achieved an award, then your 80% more effort would be worth your time. Can you see the difference? Our inability to tell that difference has helped perpetuate the snickers about RS table decorations and elaborate lesson handouts. The 80/20 principle helps us know where to draw that line. The second 80/20 principle has to do with your time. Never schedule more than 80% of your time. Leave 20% percent blank. Why? Because disasters happen. Such as your two year old deciding to decorate the dog with five pounds of honey (this happened to me!). You can’t wait until later to take care of it! And it’s going to take awhile! If you have things and places happening 24/7, when something like this happens you blow the rest of the day because there is no cushion of time for calamity, and as we all know children and calamity go hand in hand! When each activity leads to the next you can’t make adjustments. Stuff happens! Make sure you plan for it. This 80/20 principle applies in another respect. One of the reasons we want to be home with our children is to build relationships with them. You can’t do that when you are over-scheduled! When your child wants to snuggle on the couch with you and read a book that’s what you do. When they find an exciting activity for school, you run with it. They grow up so fast and there will come a day when they won’t want to do those things anymore. Don’t schedule so many activities that these special moments can’t happen. And finally we all need down time! The 80/20 principle helps is with this as well. We can’t run from activity to activity without taking time to rest and recover! This I believe is one of the leading causes of homeschool burnout. We try to do it all and make sure we do it all today! In by gone days, families spent each evening together, eating dinner, reading together, sitting on the porch watching the kids play. Maybe we need to start adding these activities to our schedules! Time maps and the 80/20 principles can really help you see where you spend your time and efforts. Maybe you are great at balancing things. If so, pat yourself on the back. If you struggle with over planning, time maps can help you learn to say no to those things that take away from what you really want to do. Go make a time map today and see! Mindy looks at the clock and realizes she has just enough time to clean up the kitchen before she needs to run out the door. She walks into the kitchen and starts to run the water in the sink. As the sink is filling she notices that the counters have school books on them. She gathers them up and heads to the dining room bookshelf to put them away. While she is in the dining room she sees that her youngest has dropped his shoes and coat on the floor. She knows if they stay there she will never find them again, so she puts the books on the table to put away in a minute and picks up the coat and shoes and heads for the closet. Then she remembers she left the water running in the sink, so she drops the coat and shoes and heads for the kitchen, catching the water just as it starts to run over the counter. She bails out the sink and puts the dishes in to soak. She turns to start to clear the counters again and finds more things that need to go in other rooms. She grabs them and heads back out of the kitchen. On her way she gets interrupted again by one of her children and she follows them upstairs to help them with something, totally forgetting about the dishes in the sink. She then realizes she needs to leave and heads out the door only five minutes late. When she arrives back home, the dishes are still in the sink. I thought I washed the dishes, she says to herself. Has this ever happened to you? It has to me! It can be very frustrating to run all day doing and cleaning and have nothing to show for it at bedtime. I tried all kinds of time management books and programs but nothing worked for me. Then I discovered that Visual/Spatial, or right brain people can really struggle with time management. Once I understood the reasons I had problems I was able to find solutions. I discovered that V/S people think differently about time and space and their minds function differently than typical left brain or A/S (Auditory/Sequential Learners) people do and that is why most time management systems don’t work. Today I want to focus on time and V/S time management. V/S ‘s need two different modes of time for different situations. They need chunks of time and small pieces of time. The chunks of time allows them to really focus on big tasks and have the time to think it through and put their whole energy into it. Most time management systems recommend taking small blocks of time and working over a long period of time to complete the task. This doesn’t work for most V/S’s for several reasons, but the main reason is using small blocks of time doesn’t allow for deep thinking or allowing creativity to flow. V/S’s are very creative and to be creative means they spend time thinking through a project from start to finish. V/S’s see things in pictures, not words. That means a project has to be thought about enough to see the end from the beginning. Then they can start on the project. Also, they need to totally focus, without distractions. When a project is worked in small chunks, they no sooner start then it’s time to finish. This makes it difficult to create! The second mode is the small piece of time. This small amount of time allows them to accomplish repetitive tasks without losing focus. V/S’s tend to be perfectionists. Usually frustrated perfectionists. They don’t want to do something unless they can do it perfectly. In other words, they clean the living room, but rather than just cleaning, they notice that the dvds are unorganized, so they stop half way through cleaning to organize all the dvds alphabetically. Nice to do, but only after the living room is clean! Thus, to a V/S, doing it perfectly requires three times the amount of time they have so they get half way through a project and then run out of time and never finish. This is how their closets fill with unfinished projects and their entire house is never clean at the same time. The solution? Breaking jobs down into doable pieces in small blocks of time. Doing something that only takes 15 minutes or so helps keep V/S’s focused enough to finish a project, especially if it is one they would rather not do. We can do anything for 15 minutes, right? This is why Flylady.net is so successful. She has broken down the chores of keeping a house into small pieces that can be done in small blocks of time. And she advocates for the use of timers! Perfect of V/S’s! Since V/S’s have a tough time telling the passage of time, they don’t notice that it is time to leave in order to be on time for the doctor’s appointment, or piano lessons, or that it is time to start dinner. Timers and clocks really help. I love timers. I have timers on my phone, on my watch, and small little timers and I use all of them! I also have clocks in just about every room in my house. I have timers on my phone that are set for piano lessons, doctor’s appointments, meetings, etc. I use the timers on my watch to help me divide my day into parts and we do specific things in each part. So my watch goes off to tell me it’s time for devotional (or my kids would never start school! ), time for the youngest ones nap, (or he would never get one), and it goes off to tell me it’s time to start dinner (or we would never eat before 9pm!). I use my little timers to help me use small amounts of time either for chores that I would spend hours on that don’t need hours or those small amounts of time before I need to leave the house or have some other commitment I need to do. It helps me to keep focused because I know when it goes off I can move on to something else! Timers are great tools! I hope this has helped you to see how time management can work for you. It has been a life saver for me. Next time we will talk about to do lists, planners and calendars, and time maps. Aren’t you excited? I love fall. I love the cooler days, the return to routine and all the fresh new school supplies! I also love all the new homeschoolers. Families who are just starting on this homeschool journey are so full of enthusiasm and new ideas. They’re also full of questions! One of the most common questions I hear is, “what does your day look like?” People want to know the nitty gritty details. How exactly does someone go about implementing all those great homeschool ideas? Unfortunately, that’s a hard question to answer, because homeschooling is a uniquely personal experience, but I do have a few tips and ideas. Be aware of the legal requirements. Each state has different homeschool laws, but they are all spelled out on HSLDA. Once the requirements are known, it’s important to realize that things aren’t always what they seem. For example, in the state of Utah, we are required to “do school” 6 hours a day, 180 days a year. That does not mean a homeschooler has to spend 6 hours a day sitting at the table doing workbooks. Any type of educational activity counts, for example: reading together, playing games, going on fieldtrips, art projects, watching documentaries, scouting, gymnastics, soccer, 4H, the list goes on and on. I’ve never yet met a homeschooler who wasn’t doing 6 hours a day of “school”. Be realistic. The world is full of amazing things to do and fabulous books to read. It is not all going to happen this year. As painful as it is, the summer list of inspiring subjects and projects will have to be pared down to a manageable amount. Every year I have to think carefully about what subjects and activities are most important to our family, and I have to let the rest go. Have fun. Homeschooling is about building families and creating a love of learning, so enjoy it! Relationships have to come first, so make the home a place where children love to be and where learning is fun! A wise friend of mine gave me some good advice this year, she said, “remember, a little goes a long ways.” And she’s right: we don’t have to spend hours every day torturing ourselves and our children with “education”. Life is full of learning opportunities—give everyone the time and the freedom to make the most of them. Guard school time. I’ve found over the years that if I don’t block out my mornings, we never seem to get any work done. It’s easy to let doctor’s appointments, visiting teaching, and errands crowd out our studies, so I have to be firm about protecting that time. Put the Lord first. Always start the day with devotional. Even if it’s a simple song and prayer, the day goes much smoother when we ask for His help first. When you are trying to figure out what subjects to study and how to reach each of your children, ask Him! He loves them and He knows them, He will guide you as you strive to do what’s best for your family. And now for the nitty, gritty. Like I said before, every homeschool family is different, and everyone has to find what works best for them, but just as an example, here’s a look at my “day in the life of a homeschooler”. 7:30 Everybody up, breakfast, dishes, get dressed. 9:30 My high-schooler goes to release time seminary. My middle-schooler works independently on his math, typing, literature, and writing. I do math and language arts with my elementary kids. 11:00 My elementary kids are “done” for the day. They play while I help my middle-schooler with any questions. My high-schooler starts on his independent work; math, literature, typing, and writing. 12:00 Lunch. After lunch we work on a read aloud book together. 1:00 My middle-schooler moves on to his “elective subjects”: computer programming, building projects, reptile keeping. My high-schooler finishes his work and moves on to his “elective subjects”: art, origami, reading. I read out loud with my younger kids. 2:00 Time for lessons, sports, friends, scouts, and errands! This is a typical day, but many days are far from typical. Sometimes we decide to blow off school for a day at the park, or if we’re all sick, we just lay around and watch movies all day. Successful homeschoolers need to plan and be flexible. So, take a deep breath and enjoy each day in this homeschool journey!